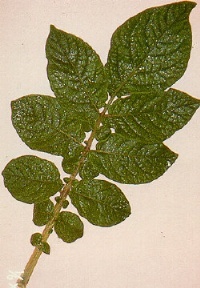 High yielding variety, attractive appearance, widely adapted. Undersizing can be a problem if soil moisture becomes limiting. Well suited for washing at maturity. Good storability. Medium specific gravity. Bred by A.E. Kehr from (la1027-18 x La1354) and selected by the Department of Horticulture, Iowa State University, Ames, Iowa, in 1957.
medium sized, upright, spreading at maturity; wings prominent. 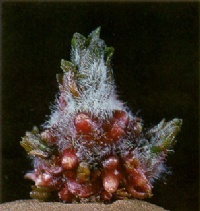 dark green, semi-open, long, slightly pubescent; midribs reddish purple. 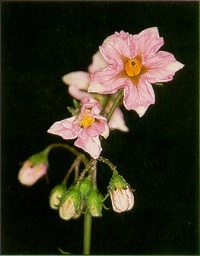 Primary leaflets: narrowly ovate, generally four pairs. 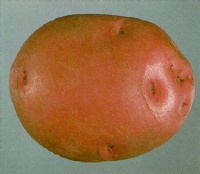 oval to oblong, smooth bright red skin; shallow to medium-deep eyes, darker than the skin; white flesh. Remark: space at 15 cm with low nitrogen for seed export. good to excellent for boiling, good for chipping at harvest, excellent for french frying; not suitable for processing. seed export, fresh market, pre-peeled product in the institutionnal trade. 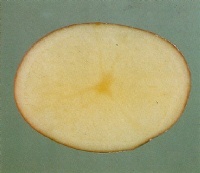 late blight, common scab, rhizoctonia, silver scurf, stem-end browning, tuber net necrosis, verticillium wilt. black leg, fusarium dry rot, leaf roll, phoma rot, PVX and PVY.